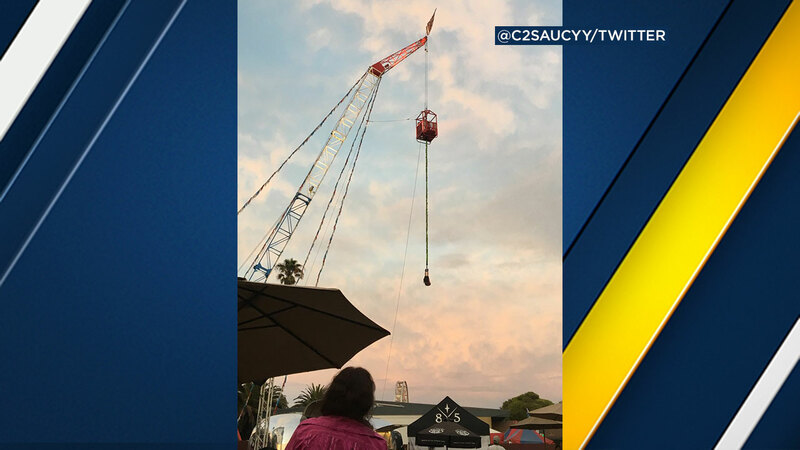 VENTURA, Calif. -- At least three people were stuck - one hanging upside down - when a bungee jump ride at the Ventura County Fair apparently malfunctioned Wednesday night. Rescue crews first helped a person who was stuck upside hanging from a crane. The person was reported trapped on the ride upside down around 7:55 p.m., but did not appear to be injured or in medical distress, officials said. After that rescue, two people remain inside a box hanging from a crane stuck high above the fairgrounds for more than an hour as crews worked out a plan to get them down. The first man attached himself to a harness and was able to lower himself down a rope to the ground. Two men stuck on a ride at the Ventura County Fair had to lower themselves to the ground using a harness. The nature of the ride malfunction was not immediately known. DEVELOPING: We will provide more details as they become available.